2-oxoisovalerate dehydrogenase subunit alpha, mitochondrial is an enzyme that in humans is encoded by the BCKDHA gene. 1 2 "Entrez Gene: BCKDHA branched chain keto acid dehydrogenase E1, alpha polypeptide". Mitsubuchi H, Matsuda I, Nobukuni Y, et al. (1992). "Gene analysis of Mennonite maple syrup urine disease kindred using primer-specified restriction map modification". J. Inherit. Metab. Dis. 15 (2): 181–7. doi:10.1007/BF01799628. PMID 1356170. McKean MC, Winkeler KA, Danner DJ (1992). "Nucleotide sequence of the 5' end including the initiation codon of cDNA for the E1 alpha subunit of the human branched chain alpha-ketoacid dehydrogenase complex". Biochim. Biophys. Acta. 1171 (1): 109–12. doi:10.1016/0167-4781(92)90149-t. PMID 1420356. Dariush N, Fisher CW, Cox RP, Chuang DT (1991). "Structure of the gene encoding the entire mature E1 alpha subunit of human branched-chain alpha-keto acid dehydrogenase complex (1991) FEBS Letters 284, 34-38". FEBS Lett. 291 (2): 376–7. doi:10.1016/0014-5793(91)81324-2. PMID 1682165. Eisenstein RS, Hoganson G, Miller RH, Harper AE (1991). "Altered phosphorylation state of branched-chain 2-oxo acid dehydrogenase in a branched-chain acyltransferase deficient human fibroblast cell line". J. Inherit. Metab. Dis. 14 (1): 37–44. doi:10.1007/BF01804386. PMID 1861457. Fisher CR, Fisher CW, Chuang DT, Cox RP (1991). "Occurrence of a Tyr393----Asn (Y393N) mutation in the E1 alpha gene of the branched-chain alpha-keto acid dehydrogenase complex in maple syrup urine disease patients from a Mennonite population". Am. J. Hum. Genet. 49 (2): 429–34. PMC 1683290 . PMID 1867199. Fisher CR, Chuang JL, Cox RP, et al. (1991). "Maple syrup urine disease in Mennonites. Evidence that the Y393N mutation in E1 alpha impedes assembly of the E1 component of branched-chain alpha-keto acid dehydrogenase complex". J. Clin. Invest. 88 (3): 1034–7. doi:10.1172/JCI115363. PMC 295513 . PMID 1885764. Zhang B, Zhao Y, Harris RA, Crabb DW (1991). "Molecular defects in the E1 alpha subunit of the branched-chain alpha-ketoacid dehydrogenase complex that cause maple syrup urine disease". Mol. Biol. Med. 8 (1): 39–47. PMID 1943689. Dariush N, Fisher CW, Cox RP, Chuang DT (1991). "Structure of the gene encoding the entire mature E1 alpha subunit of human branched-chain alpha-keto acid dehydrogenase complex". FEBS Lett. 284 (1): 34–8. doi:10.1016/0014-5793(91)80755-R. PMID 2060625. Matsuda I, Nobukuni Y, Mitsubuchi H, et al. (1990). "A T-to-A substitution in the E1 alpha subunit gene of the branched-chain alpha-ketoacid dehydrogenase complex in two cell lines derived from Menonite maple syrup urine disease patients". Biochem. Biophys. Res. Commun. 172 (2): 646–51. doi:10.1016/0006-291X(90)90723-Z. PMID 2241958. Zhang B, Edenberg HJ, Crabb DW, Harris RA (1989). "Evidence for both a regulatory mutation and a structural mutation in a family with maple syrup urine disease". J. Clin. Invest. 83 (4): 1425–9. doi:10.1172/JCI114033. PMC 303839 . PMID 2703538. Fekete G, Plattner R, Crabb DW, et al. (1989). "Localization of the human gene for the El alpha subunit of branched chain keto acid dehydrogenase (BCKDHA) to chromosome 19q13.1----q13.2". Cytogenet. Cell Genet. 50 (4): 236–7. doi:10.1159/000132768. PMID 2805821. Fisher CW, Chuang JL, Griffin TA, et al. (1989). "Molecular phenotypes in cultured maple syrup urine disease cells. 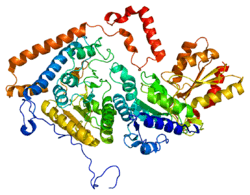 Complete E1 alpha cDNA sequence and mRNA and subunit contents of the human branched chain alpha-keto acid dehydrogenase complex". J. Biol. Chem. 264 (6): 3448–53. PMID 2914958. Zhang B, Crabb DW, Harris RA (1989). "Nucleotide and deduced amino acid sequence of the E1 alpha subunit of human liver branched-chain alpha-ketoacid dehydrogenase". Gene. 69 (1): 159–64. doi:10.1016/0378-1119(88)90390-3. PMID 3224821. Hu CW, Lau KS, Griffin TA, et al. (1988). "Isolation and sequencing of a cDNA encoding the decarboxylase (E1)alpha precursor of bovine branched-chain alpha-keto acid dehydrogenase complex. Expression of E1 alpha mRNA and subunit in maple-syrup-urine-disease and 3T3-L1 cells". J. Biol. Chem. 263 (18): 9007–14. PMID 3379058. Chuang JL, Davie JR, Chinsky JM, et al. (1995). "Molecular and biochemical basis of intermediate maple syrup urine disease. Occurrence of homozygous G245R and F364C mutations at the E1 alpha locus of Hispanic-Mexican patients". J. Clin. Invest. 95 (3): 954–63. doi:10.1172/JCI117804. PMC 441427 . PMID 7883996. Chuang JL, Fisher CR, Cox RP, Chuang DT (1994). "Molecular basis of maple syrup urine disease: novel mutations at the E1 alpha locus that impair E1(alpha 2 beta 2) assembly or decrease steady-state E1 alpha mRNA levels of branched-chain alpha-keto acid dehydrogenase complex". Am. J. Hum. Genet. 55 (2): 297–304. PMC 1918348 . PMID 8037208.